Kairali- The Ayurvdic Healing Village recently got listed as one of the best aryuvedic resorts and treatment center of India in a press release by the Compass India Holidays - a travel company that has over eleven years of experience in custom designing luxury holidays around the Indian subcontinent, specifically India, Nepal, Bhutan and Sri Lanka. The Press release was featured in www.releasewire.com. Traverse India to Discover the Healing Secrets of Ayurveda with Compass India Holidays Pvt. Ltd.
Today’s hectic pace and erratic lifestyle has created a disharmony and imbalance leading to a number of stress-induced diseases. Positively energizing the mind, using effective breathing techniques, exercising , feeding the body the right kind of seasonal foods are some ways to help eliminate this stress. New Delhi, India -- (ReleaseWire) -- 02/18/2015 -- Today's hectic pace and erratic lifestyle has created a disharmony and imbalance leading to a number of stress-induced diseases. Positively energizing the mind, using effective breathing techniques, exercising , feeding the body the right kind of seasonal foods are some ways to help eliminate this stress. Translated as "the science of life", Ayurveda is a five thousand year old healing system that originated in India, focusing on establishing and maintaining balance of mind, body, spirit in a healthy and holistic way. Ayurveda is a complete way of life, based on preventing disease and enhancing health, longevity and vitality. Ayurveda aims to achieve harmony and balance and believes in the treatment of not just the affected part, but the individual as a whole, ensuring it is the natural way to a refreshed soul, free of toxic imbalances - a key to better health and resistance to disease. This harmony and rejuvenation of the mind , body and soul is attained through diet, meditation, gentle exercise such as yoga, herbal medicines and physical therapies , such as medicated oil massages. There are staggeringly large numbers of tourist attractions in India, given its vast, varied and gorgeous topography .World heritage sites, golden sun-kissed deserts, historical monuments, formidable forts, palatial palaces that narrate stories of its rich colorful past. Apart from exploring the diversity, cultural heritage and intriguing tapestry of this fascinating land, a lot of seasoned travellers now come to India seeking peace, well-being and spiritual solace. Ayurvedic resorts have become popular destinations for relaxation and rejuvenation while Ayurvedic hospitals cater to people seeking Ayurvedic treatments for more serious health problems. Catering to such demands and request from their esteemed guests, Compass India Holidays Pvt. Ltd. has re-introduced the Ayurveda Tours which are specially customized and crafted for guests who would like to explore the healing secrets of this ancient science. The 14 day itinerary is designed to ensure a relaxing stress-free holiday in a renowned Ayurvedic resort with treatments suited to the clients budget, time and needs to combat the stress of today's hectic lifestyles. A leader in luxury travel, Compass specializes in crafting tailor made journeys for sophisticated, discerning travellers. Compass knows what it means to deliver a meaningful, memorable and valuable travel experience. "We at Compass Holidays are whole-heartedly devoted to providing a kaleidoscopic view of this wonderland to the world. 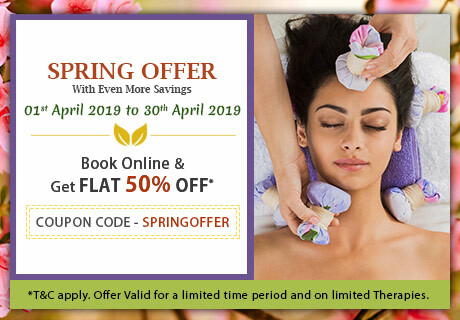 Our clients who want to combine the pleasure of luxury travel with these ancient therapies can choose from our sample bouquet of itineraries or our travel specialists will custom design an Ayurveda tour in India for you according to your preferences and inclinations." says Durjay Sengupta, the CEO of Compass India Holidays. According to the Ayurvedic principles, every person is made of a combination of five basic elements found in the universe: Space, Air, Fire, Water and Earth. These elements combine in the human body to form three life forces or energies, called doshas and they control how the body works. Today Ayurveda is widely recognized as a unique indispensable branch of medicine, a complete naturalistic system that depends on the diagnosis of your body's humours - vata, pitta and kapha - to achieve the right balance. The therapies are applied to treat all kinds of chronic and lifestyle disorders such as diabetes, arthritis, stress, migraine, high blood pressure, skin diseases, asthma, spondylitis, obesity and sexual disorders, amongst others. From beauty care to stress management and from slimming program to stress management and anti-aging program, this system offers a lot of options. India has many options for Ayurvedic centers and has in many ways influenced the tourism industry as well. At present, Kerala leads the way as an Ayurvedic tourism destination in India, and offers a multitude of Kerala Ayurvedic tour options but there are some other places, notably in the western Himalayas, which are also covered by this specially customized tour package. Ananda in the Himalayas, close to Rishikesh, with the views of the Ganges on one side and the mountain peaks on the other pleasing the tourist's eyes, mind and spirit upon waking up every morning. Recognized by Travel + Leisure magazine Ananda is set over a sprawling landscape of 100 acres in the middle of an evergreen forest, the property holds Deluxe Rooms, Villas and Suites besides modern amenities. At the Spa and Wellness center, which is spread over an area of 24,000 square feet, one can expect an extensive menu of body and beauty treatments, yoga courses, and massage and Ayurvedic therapies. Further, the qualified nutritionists, Western and Ayurvedic physicians, spa therapists with knowledge of ancient Indian sciences and modern western treatments guide you through several personalized therapies to meet individual health goals – de-stress, detoxification and cleansing, deep relaxation, anti-ageing and weight & inch loss. Located in one of the popular tourist destinations in India, Palakkad in Kerala, the Kairali Ayurvedic Healing Village Health Resort upholds an authentic principle of Ayurveda in order to propagate health and wellbeing worldwide. The Ayurvedic Healing Village remains true to ancient Vedic practices in every respect; from its highly qualified Ayurvedic doctors and renowned health practices to the architecture of its thirty guest villas. Acres of organic Ayurvedic farmland surround a sprawling jungle sanctuary, perfectly blended among coconut, teak and mango trees, while offering the height of luxury hospitality and the best of modern facilities that includes a library, cyber center, swimming pool, tennis court, conference halls and amphitheater, making it the perfect location for those looking to go deeply into holistic practices of any kind. Goa, a very popular beach and party destination has now carved an identity that appreciates art, culture and holistic living .The city is fast emerging as one of the potential tourist spots on the map of Ayurveda tourism in India. Coconut palms swinging to the rhythm of the breeze and the Mandovi River flowing alongside one of the islands in Goa complete the scenery at Devaaya Ayurveda Centre in Goa. Naturopathy becomes a way of life at this Ayurvedic paradise that brings together the essential elements of 'Panchakarma' treatments with yoga, meditation, music, lifestyle correction and diet planning for their clients. Combined with sightseeing these vacations are a perfect way to relax, rejuvenate and energize oneself. These resorts located amidst nature, over sprawling and pristine forests lure guests and weary travellers into its peaceful and quiet edifices. Take a break from the hustle and bustle of life and discover the healing powers of Ayurveda through this luxury Ayurveda tour in India with Compass India Holidays. Revitalize the internal and external beauty with the spectacular experiences that this enchanting land has to offer. Compass India Holidays Pvt. Ltd. is a luxury travel management company that specializes in creating bespoke and unique experiences for the discerning travelers. Combining global outreach with local expertise they ensure that their guests relax in the lap of luxury and immerse in the pleasures of a stress free, well crafted holiday. Virat Vaibav, a widely circulated Hindi daily in northern India featured a niche and interesting article on the various oil treatments and ayurvedic therapies that can be availed at The Ayurvedic Healing Village. The article states that The Ayurvedic Healing Village in Palakkad, Kerala is one of the best ayurvedic health resorts for authentic aryurvedic treatment and it provides its guests with rejuvenating, relaxing and healing ayurvedic oil massages. All the Ayurveda therapies offered here are aimed at complete physical and mental rejuvenation and are sans any side effects. The Ayurvedic Healing Village is the best destination in India for holistic mental and physical healing with an array of authentic and genuine ayurvedic treatments and therapies.